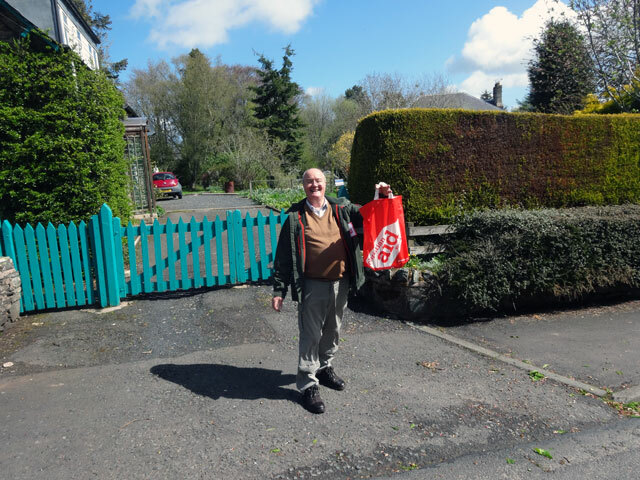 After getting up and walking Mix, Tom and I set about distributing Christian Aid envelopes, visiting Gavinton, Cranshaws, Longformacus and Abbey St. Bathan’s before returning; driving into Berwick to buy food for the Christian Aid soup and bread and cheese lunch in the church hall tomorrow. We did a lot of the shopping at Aldi where I was amazed at the price of everything – amazed at how inexpensive everything is! Then we went on to Morrisons to buy some really nice bread. By this time it was almost time for tea – it had been a long day but a happy one working away with Tom and catching up with each other’s news as we wandered all around the parish. Back home I walked Mix and after supper in the Farmhouse, we settled down in the Granary to watch television and the puppy (who is already quite at home and absolutely fearless). I walked Mix and watched the News before bed. (I must say that the News programmes still seem to have a down on the SNP even after they were elected after such a landslide. I don’t know how often I heard today that it was unfair that each SNP politician required so few votes to get elected compared to UKIP which only got one MP after several million votes. I wished someone would set out the real situation. The SNP got more votes per person than Labour had ever got to return its huge number of Scottish MPs in the past. More people voted SNP than had ever voted for any political party in Scotland before. In fact the SNP’s election record is quite amazing. The Scottish Parliament was designed on the basis that it would always require a coalition to run the country but so many people voted for the SNP that it broke the system and returned a majority government. In the General Election, the SNP took all but three Scottish seats gaining more than fifty per cent of all of the votes cast. Compare that with the winners, the Conservatives, who only gained thirty-six percent of the vote and it is easy to see the scale of the SNP’s triumph. Remember, too, that the SNP is in favour of proportional representation, Labour and the Conservatives voted it down last time, so it is all the more strange to hear them complaining now about the success of the SNP.